You are here: Home / cooking for kids / You’ve Been Ghosted! In preparation for Halloween, have the children help you play this fun game with their friends and neighbors. Fill a gift bag with Halloween treats or the Nutter Butter Ghost Cookies we made (see recipe below). Or, try these cute ghost cookies we made last year. You can add anything related to Halloween in the bags including: Halloween candy, little plastic spiders, or rubber Halloween characters. 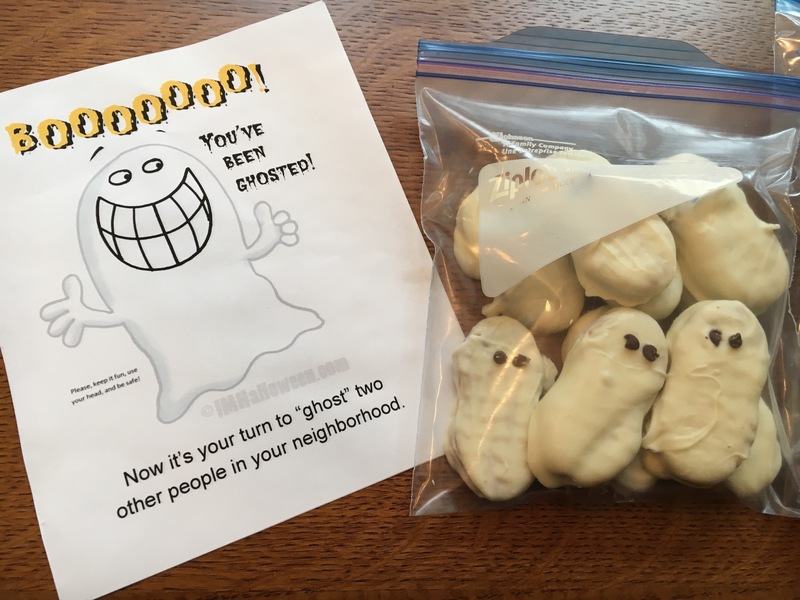 Include a message in each bag to remind friends to spread the fun by ghosting two more people in the neighborhood. Click here for a cute message to print and include in the bags. Then put the bag of treats anonymously on the friend’s front porches. Late last night, we left you a treat. The tradition is fun, one we hope you’ll repeat. to let others know, need ghosted no more. to two more families, we must advise. within two nights, under the light of the moon. To make these ghosts cookies purchase Nutter Butter brand peanut better cookies, a bag of white chocolate chips, and a small bag of semi sweet chocolate chips. This works best if you have someone to help. Have the adult dip the cookies and the kids can do the eyes. 1. We lined cookie sheets with parchment paper. 2. Pour the bag of white chocolate chips into a microwave safe bowl. Very slowly heat the white chocolate chips. Beware: it is very important not to overcook the chocolate. Heat the chocolate in the microwave on High for ten seconds, then stir. Heat the chocolate for another ten seconds then stir until the chocolate is smooth. 3. Dip one cookie at a time into the melted smooth chocolate until the cookies are completely white. 4. Lay the dipped cookie on the paper. 5. Put two chocolate chips on the cookie to look like eyes before the chocolate hardens. Note: Since the chocolate hardens in a few minutes, start the process over again once the chocolate is thick and hard to spread on the cookies.